You can only approach the archipelago by boat. If you catch the earliest ferry from Marseille’s Vieux Port you will be travelling with tins of tomatoes, olives, stacks of damp lettuce, the postman with his sack. Any later and the tourist queues stretch into the square, large cameras ready, not bound for where you are going. It takes a long time to get out of the harbour but passing the final fortified walls the engines roar and the prow pitches itself into the waves, soaking anyone so impatient to get to the islands that they have to sit outside. The first time you visited Frioul you sat on a plastic seat with your suitcase between your knees and the view obstructed by spray on the dirty windows and waited with no expectations. You didn’t know, then. Every time you have returned you let yourself get salt-stiff and sticky, rising over the railings on your knees and waiting for that first sight, drenched through with a smile that could split continents. Frioul rises from the sea as a pair of ossified lungs, white stone bleached by salt and sky, darkened in patches with gnarled scrub. The main islands – Pomègues and Ratonneau – are joined by an artificial causeway, the primary bronchus. “Do not obstruct”, “Danger of death” warn the signs. Do not block this airway, earthway, seabone, you think. It creates a stillness in the harbour facing the city, an artificial rectangle of water where even the keening seagulls and high jangle of lines against masts are muffled, reluctant to break the hush. The right-hand quay of Ratonneau is the only place where people live now, the buildings squat and painted ochre and yellow, in straight lines like shoeboxes stacked against and into the cliffs. Walking from the boat you pass an iron rhinoceros with a Perspex box filled with books in its stomach (take one, leave one), then a small restaurant, the first in a row. The blue one, the Commodore, is the best in the morning. Small cups of bitter black coffee, a cinquante-et-un if there is a mistral rising and you want to swim anyway. The normal rules don’t apply here, as though by stepping on to the shore your breathing is the swell and break of the ocean, and Frioul ceases to be stone pulmonary, sinks into your chest, curls round your heart, becomes part of you. On the other side of the causeway, on the edge where the entire fetch of the sea from Algiers breaks against the calanques, there is no more placidity. Walk past the bronchus, up past a sewage plant rich and rotten, up the island of Pomègues. There are no cars, no buses, no bicycles, just white dust, white chalk, un-cemented walls of rough stone and fossils bulging out of the rocks. Small ceramic signs in French point out the ecological and geographical areas of interest, painted by hand in cursive with naïve pictures of birds and flowers. You cannot speak here, even if you wanted to. The wind whips everything but the roar of the air and salt out of your brain this high up. The sea becomes the ocean now, deep and wild – only here will you understand Homer and his wine-dark adjective. It is not a colour, it is a state of intoxication. 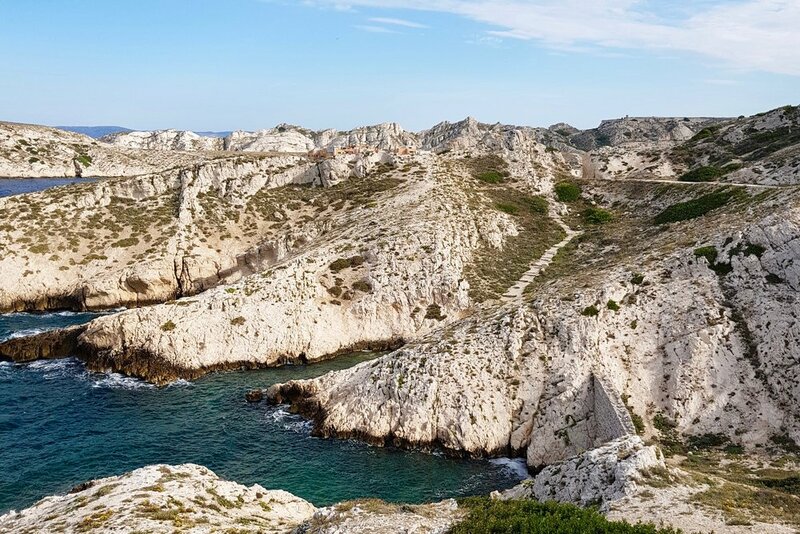 The need to get down to a calanque is inexorable. Sometimes there are rough-hewn half-steps for a little of the way, surrounded by small bushes and chattering crickets. Sometimes there is just a scree-slope, sliding tottering down like a new-born colt until you reach the hot harsh entrance to the water. A hundred feet of slithering and heart rushing up into your throat because the sea calls you that closely, but when you get there the rocks level out between the cliffs, wild rosemary scents the air, it is womb-like and quiet. The wind drops, you are protected and can hear your own thoughts again. The entrance to the sea is sharp: black algae and slippery, white salt crusted hollows and desiccated seaweed. The water turns from milk jade to deep lapis scudded with breaking wavelets. The wildness and isolation invite you to take off all clothing, this is not an environment in which barriers are appropriate. You need to feel everything. So, naked and careful, you pick your way over the rocks and slip a foot down into the water – cold, colder than would be expected because of the exposure and the wind – and look down for sea urchins and weever fish and feel the soft skin of your feet prick and bite with sharp step and soft slime you slip, eel-like down into the blue. Pull a mask around your head and swim out by the rocks, the sea bed dropping away like a challenge. Dive down, breath held until the blood pumps and screams in your skull, but you do not want to let go until you have scraped up a palmful of sand and risen, looking at the surface above you reflecting gold and silver in the sun. Swim around the outcrops, let your arms hang down like lead to brush fish with your fingertips. This is an archipelago of sensation, which is why you come back again and again. Once you have had this intensity nothing else will suffice. There is your time on the islands, and the times when you are waiting to return. Ratonneau is different. There is an old quarantine hospital, the rotten history of yellow fever. The beaches here are sandy, shallow, anaemic in comparison. It is shattered-out aircraft hangers and an abandoned fortress. Walk along the front to a small Pizzeria, run by a large man with a diamond earring. He brings out carafes of rosé and salads and pizzas piled high with mussels and anchovies. The tables are shadowed by gnarled trees and umbrellas, growing up together in tangles. You can spend an afternoon there if you are so inclined, with only a handful of Euros and a flattering word. An eleven-year-old French girl, still soft and downy, watches you order a salad. Her mother orders a salad. Her brother and father and order pizzas and she looks at me. She points shyly at your plate and you feel like you are ruining something. Even in a wanton Eden we learn how to behave in public, as women. There is a cleft in the cliff on Ratonneau that makes it wild. You need to go under signs that say “Falling rocks’, so it is best if you are tipsy-on-the-edge-of-invincible drunk. Tourists do not come here, it looks lithic and dank. The bay spreads out, and Frioul is no longer lungs but wings, moonlit cove cliffs arching over the shoulders like splayed feathers into the sea. On this side there is no necklace of reflected lights from the harbour, no glow from the port. It is so dark when you slip in, naked again because propriety still feels like an affront, small plankton and sea debris hit your thighs and ribs and fluoresce. This is the only time you will ever feel beautiful, swimming out until you float in the black silk-ink. Limbs like muted ceramics or the white rocks that have been hollowed out by the endless beat of the waves are buoyed up in a caress. Turn to lie on your back and the sea is a fulcrum in the middle of the spine, supporting you until pliant and integral. Mornings are slow here: The Commodore, a double espresso. With only a single line of human habitation a routine sets in within hours. Wake, shower away the sweat of the night, pull on a swimming costume and a dress. The Commodore: “Deux cafés s’îl-…merci, merci à vous,” and you feel simultaneously lonely and part of these islands. You walk and swim and then come back, savoury with wild plants and cool from the sea, and drink wine and sleep. You didn’t know about the gullery for your first three visits. The discovery changes the feel of the archipelago slightly, when you find it. One evening you take a walk, don’t turn on to Pomègues as usual but take the cliff path up, far past people live, and go onto the headland of Ratonneau. No-one can swim here, it’s a carving-knife drop into the sea and there are no real tracks. It feels like the top of the world. Dry thicket, nests on the ground, the glow of a blue and orange sunset and the vicious gulls. Have you ever seen one up close? They are beautiful, a great curve of wings, hard beaks, strong and muscular. Bigger than you would imagine, and you can remember being told a swan can break your arm if you get too close. They are smaller than swans, but wilder. No-one would could describe a gull as serene. Walk through their egg grounds carefully, this is why they are screaming at you, but you need to get to the furthest point you can. Contusions from your calanque swimming are budding over your chest and arms, blood rising into barbules. You must have hit some rocks without realising. Capillaries burst into epidermal spines, dappling your skin in brown-blue bruises. The wind raises goosebumps on your bare skin, and in the setting sun you look almost feathery. You slip yourself down on the edge of the cliff, scaly dry legs dangling over the sea. For a moment, the gulls and the cliffs and the breath of the wind are encouraging you, so much part of you that you think you could. You know. There is only one departure from this archipelago. Sylvia Warren is an assistant commissioning editor and also writes monthly features about books and publishing for an Oxfordshire-based magazine. She likes wild swimming and enforcing style guidelines.